Kitsie Lundell started working at the Philadelphia School of Circus Arts this summer because she wanted to leave the 9-to-5 crowd. Now she’s juggling, unicycling and swinging from large pieces of fabric for a living. Kitsie Lundell had it made. Before graduating from the Moore School of Art and Design, she was offered a job as a graphic designer in the corporate world – a job in her field of study that would also provide financial security. But after four years of “just being part of the system,” Lundell quit her job and joined the circus. While she won’t be performing with Ringling Bros. and Barnum and Bailey any time soon, she’s an eager student at the Philadelphia School of Circus Arts. PSCA director Shana Kennedy said she will be adding new classes, teachers and performances to the organization’s roster (Michael Samuels/TTN). The Philadelphia School of Circus Arts is the only one of its kind in the mid-Atlantic region and one of few in the United States. Shana Kennedy, professional aerialist and director of PSCA, opened the doors to her circus arts school in June. Kennedy said students have traveled from as far as Brooklyn, N.Y. and Wilmington, Del. to attend classes. 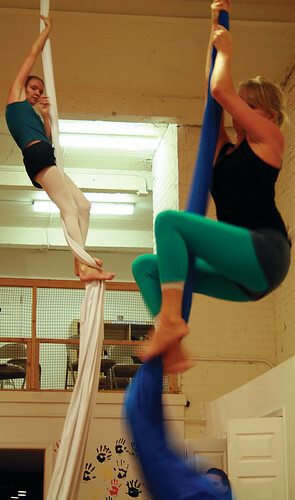 PSCA offers a variety of classes, including aerials, juggling, trapeze and unicycling. The aerials class is very popular among beginners. Students of all ages are challenged each week to fight their fears and swing gracefully from a string of colored fabric in front of complete strangers. Lundell was introduced to contemporary circus arts through the aerials class taught by Kennedy. In her senior year of college, she chose the circus as the subject for her thesis and took a class for fun. together for research. After the first class, I was addicted,” Lundell said. Lundell completed her thesis, but continued to take Kennedy’s classes three days a week. Although she had no intentions of going to circus school, aerials gave her creative inspiration and a unique hobby. Today, Lundell is the office manager and designer for PSCA and also a freelance graphic designer. She is still not sure of her final career destination, but for now, she’s content. Although she is expected to speak highly of PSCA, she said she would recommend the classes even if she weren’t an employee because they build strength and increase confidence. “You find strength you never thought you had,” Lundell said when asked about her experiences as a student. Andrea Braverman, a beginner trapeze student, agrees. Her daughter takes trapeze classes, while her son takes a juggling class. “It’s a physical challenge, but it looks so beautiful, so I’ll stick with it,” Braverman said. Eleanor Grosch said taking classes at PSCA is better than going to the gym. “I’ve been going to the gym . . . lifting weights and doing cardio, but nothing works as well and is as fun as this,” said Grosch, who is a student in the handstands and backbends, rope and fabrics classes. For those who are considering taking a class, PSCA has a wide range of students: men and women, children and retirees, from stay-at-home moms to chemists. “Many of the students who come in don’t have a lot of physical strength, yet with practice, they do become very strong,” Lundell said. Kennedy said that the future holds continual growth for PSCA. New teachers are being added, and more fitness disciplines will be offered to students. More performances and special events will also take place at the school. She is thrilled to have brought circus arts to the community.